Click here for our price list page. 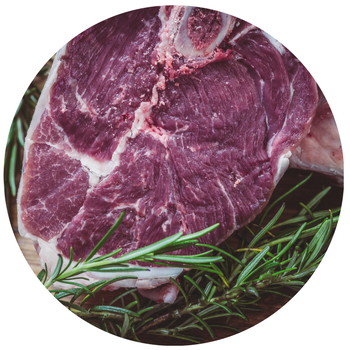 Our USDA-inspected grass-fed beef is available by the side or by the individual piece. We like to raise dual-purpose (milk and meat) beef. We currently use Milking Shorthorns, and we've recently introduced Fleckvieh (pronounced FLEK-vee), an old-fashioned European breed. They are rotated through our chemical-free pastures to take advantage of the best grasses. It takes longer to raise beef the way we do it, but we’re sure you’ll agree that the taste and health benefits make it worth the expense. But is it really more expensive? Eating whole, clean food now probably means that you’ll save money later in doctor visits and medical bills. Think of it as the real 'health insurance'. It's a good investment in yourself and your family. Not to mention, it tastes better! Our sheep are grazed on our chemical-free pastures, and always have fresh water and minerals available. Please remember that lambs are not processed until they are almost a year old. Apparently, they must be labeled as mutton after that. So don't worry....we don't do veal and we don't do baby lamb. Our grass-fed lamb looks like a full-grown sheep. You can purchase a whole lamb or buy individual USDA-inspected cuts. Our family has truly enjoyed every cut we've had, and we look forward to sharing this rich tender meat with yours. Our eggs are more nutritious due to the hens’ diet of fresh grass and bugs as they travel around the pastures. They're supplemented with non-GM feed, and they give us brown eggs — same good nutrition as white eggs, just a different color package. Pick some up at the farm or choose one of our delivery locations! Click here to contact us to schedule a time! Always in high demand and short supply! We want you to experience watching your milk go from cow to bottle. Our customers tell us all the time how much fun they had when they came out, and how they appreciate being welcomed to watch and ask questions. All the milk we produce goes from our farm right onto your table, so we have to be different. Our raw milk is from primarily grass-fed cows, and we don’t use steroids, hormones, GMO's or feed antibiotics. It’s not homogenized or pasteurized so it's got all the enzymes and ‘good bugs’ that our digestive tracts need to flourish (plus all that great cream). Our ‘lactose intolerant’ customers get so excited when they try our milk and can drink it with no tummy upset! Come inspect our dairy parlor. We welcome the chance to show you our farm, and get to know how we can help you get those tasty meals on the table! Click here to learn how to get started! If you'd like to order 1/4 or a side of beef, or a half or whole lamb, click here to let us know you're interested! We'll give you the scoop. Head out to the farm to pick up your real food (and milk a cow while you're at it!) or meet us at one of our delivery locations.